It's been a bad week for the DRS, or so they say. It hasn't, of course, because DRS is a piece of technology, implacable and unyielding. Its week was neither good nor bad. What they mean is, it's been a bad week for those tasked with operating and interpreting the DRS - us fallible, biddable human beings. It's us who had the bad week, with our talent for tying ourselves in endless knots over something designed to streamline our lives. There was a revealing radio interview with the former umpire John Holder following the Jonathan Trott lbw decision in England's second innings (and how long ago that one seems now - day three wasn't it?). Holder told his interviewer that he had seen the incident on the television highlights, and he didn't think Trott had hit the ball. I watched it on the highlights too. Aside from what looked like a deviation from Trott's inside edge, Snicko (which legendarily takes so long to "build", it is not a part of the DRS, although given that the length of DRS pauses is now drawing out to biblical proportions, Snicko must be edging into the frame) suggested that the contact with Trott's bat was audible. That's something Holder presumably saw too, and yet he still felt Aleem Dar's initial decision was correct. The point here is, human beings quite often see what they want to see - a view shaped by their experience, an interpretation of the facts. A retired umpire like Holder is not just using the technology but a deep intuition built upon the many thousands of deliveries he has watched from close range. It's impossible to factor that human element out of the process, as some of the decisions made by third umpire Erasmus showed ("Erasmus' Ashes" doesn't have quite the same ring to it, does it?). These are not flaws within the DRS system. They're a part of being human, and the fallibility of players and officials is part of sport. We would lose something of the essence of a contest without it because chance, fluke, luck and error have an essential role. The real problem with DRS protocol, as Ian Chappell highlighted and I have blogged before, is that it politicises decision-making and asks the players to umpire their own game. There were two instances at Trent Bridge that worked against the essential fairness that should be extended to both players and officials. The first of those was Stuart Broad's ridiculous non-dismissal, which was due to Australia having used up their reviews. It was exactly the kind of "howler" the system is trumpeted to eliminate, and yet it can't because it is stymied. Officiating is the job of officials, not players, and we have reached the point where the three main umpires must work as a team and use technology in each decision as they see fit. The second was less obvious, but no better for the game. When Brad Haddin's wicket fell to end the match, the only recourse umpire Dar had to technology to help him make what was a hugely consequential and ultimately marginal decision, was to give Haddin not out, and rely on Alastair Cook using a referral to trigger the Hot Spot and stump-mike technology. No one except the umpire knows whether that's what he thought, but regardless, his ability to give a fair decision was impeded because he couldn't use the technology himself; he had to wait for the players to. It's interesting to speculate whether, had Cook had only one referral left, he would have used it. Only Matt Prior of the England players appeared genuinely convinced of the edge. 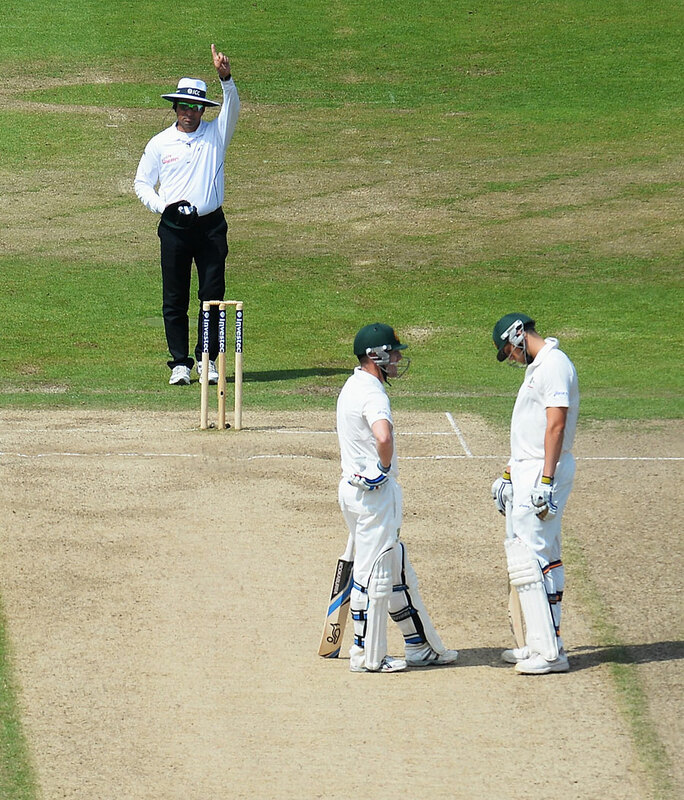 Under a system administered entirely by the umpiring team, the third umpire would have been able to tell Dar that Broad had been caught, and Dar would have been free to consult his colleagues over Haddin's dismissal. Umpires should umpire and players should play. The machines, implacable as they are, can only serve us in the way we ask them to. Blogs If Gilchrist is good, is Waugh bad?